For me, September just isn’t complete without something apple-y. 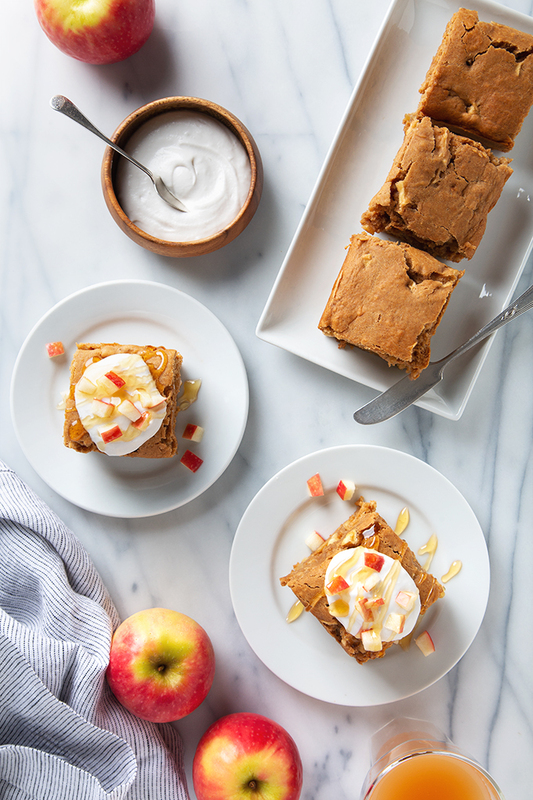 When I’m not dipping apple slices in almond butter, I’m usually baking up apples in cake. And, guess what’s even better than homemade apple cake? 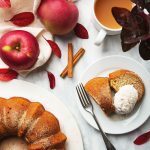 Homemade apple cake that’s easy enough for after-school weekday baking, and wholesome enough to eat as an afternoon snack. 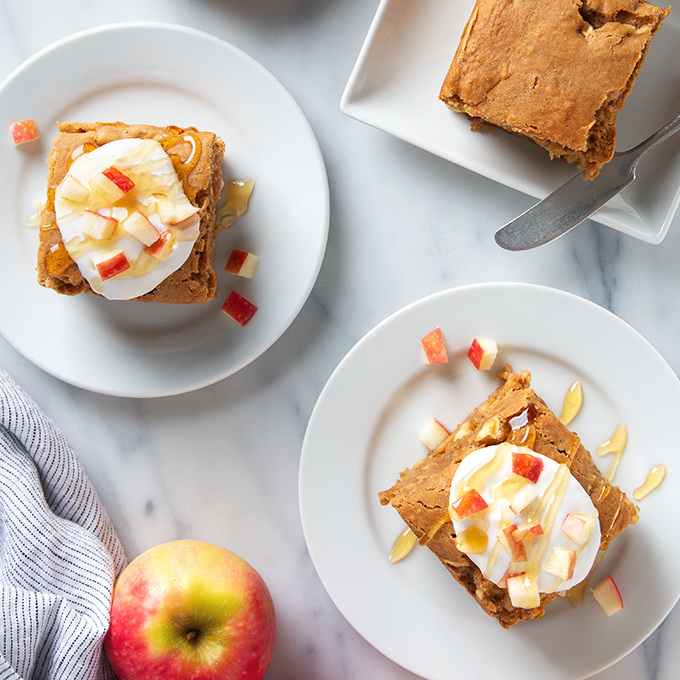 The thing that I really like about this apple snack cake recipe is that it hits the not-too-sweet sweet spot. This is thanks to the natural sweetness of the apples, which I include in three forms: chopped apple, applesauce, and apple juice. 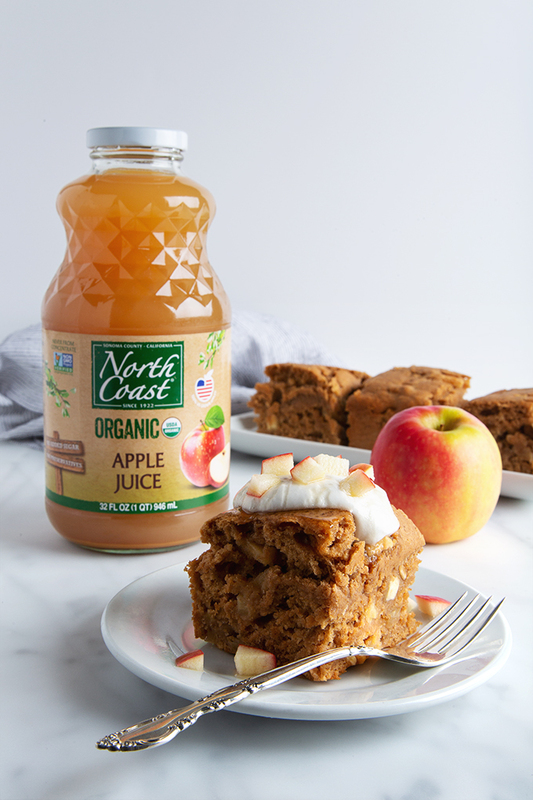 The apple juice is from a company called North Coast and it’s my go-to for flavor and quality. It’s unfiltered, so it has that delicious apple cider vibe, and it’s also certified organic, non-GMO, and made from one ingredient—apples. North Coast also happens to be located in Sebastopol in Sonoma County, which is one of my favorite spots in all of the country. Aaron and I spent a month staying at a little airbnb in Sebastopol when we did our year-long road trip a few years ago and we fell head-over-heels in love with the town and, of course, the incredible produce there. P.S. Want to win a $250 Visa gift card to fund a last summer adventure or your next grocery run? North Coast is currently hosting a giveaway—check it out on their Facebook page! 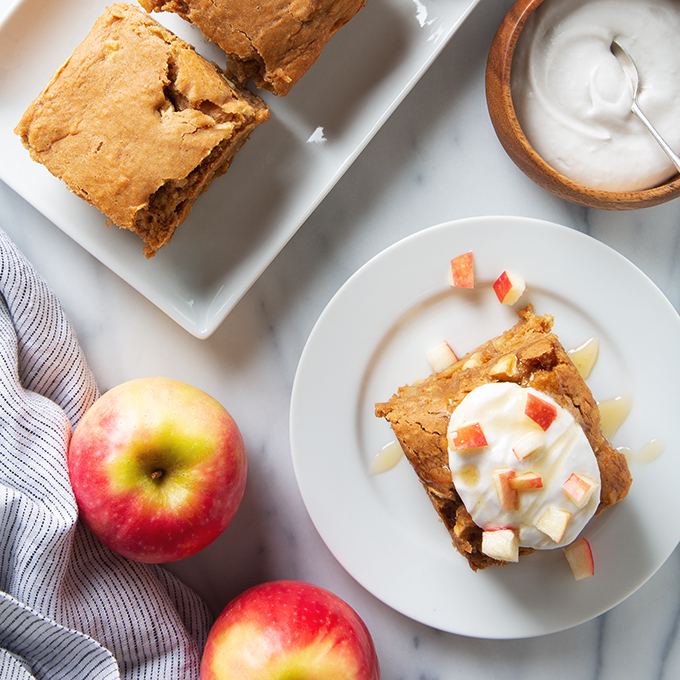 Wholesome apple snack cake packed with the best Fall flavors! 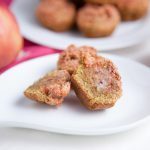 This simple vegan snack cake is made with white spelt flour, lower-glycemic coconut sugar, chopped fresh apples, and it's so easy to make. Preheat the oven to 350° F. Lightly grease an 8 x 8 inch pan with coconut oil. Line the pan with parchment paper, allowing two sides to hang about ½ inch over the edges. In a large mixing bowl, combine the apple juice, coconut sugar, applesauce, coconut oil, and vanilla. Sift in the spelt flour, cinnamon, baking powder, baking soda, and salt. Mix the batter until just combined (it will be thick), then fold in the diced apples. Transfer the batter to the prepared pan. Bake for 30-35 minutes, or until a toothpick inserted in the center comes out clean. Let cool completely then slice into squares. Optional: Serve with a generous dollop of coconut whipped cream, drizzle with maple syrup, and sprinkle with chopped apple. Leftover snack cake can be stored in an airtight container in the refrigerator for about 5 days. It also freezes well. *Be sure to stay away from coconut milks with stabilizers and gums because the cream won't separate from the liquid even when refrigerated. I've found that the Aroy-D brand tends to produce reliably good results. Thank you to North Coast for sponsoring this post! We love their organic and non-GMO apple juice and cider, apple cider vinegar, and applesauce. You can find North Coast products on sites like Amazon and VitaCost, or check out their store locator to see if they’re carried locally near you. Filed Under: Breads, Cupcakes & Cakes, Snacks COPYRIGHT © 2019 Amanda Maguire. All Rights Reserved. 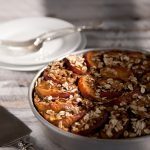 Definitely putting this snack cake on my list to make next! It sounds amazing and looks so perfect for fall!! I have everything to make this – yay! I wonder if chopped walnuts would be good on top too?! Yes! Two big thumbs up to chopped walnuts on top. Love that idea! 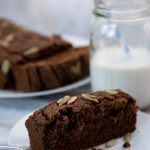 This snacking cake sounds wonderful! Any excuse to eat cake, right? 😉 Love the clean and simple ingredients here! Any excuse to eat cake is right. 🙂 I think you’re going to love this cake, Susan. It’s so apple-y and just the right amount of sweet. This look fantastic, Amanda! I have some homemade cinnamon apple sauce that will be perfect in this!